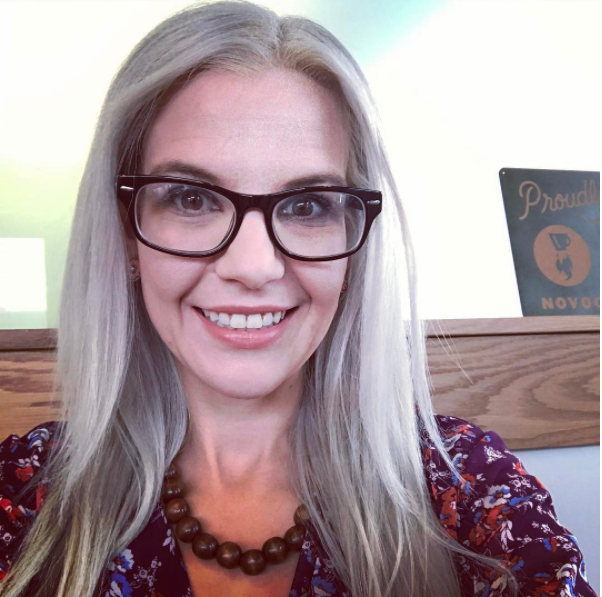 Halloween is just around the corner and between getting costumes on and having dinner, getting ready for trick-or-treating can be a very busy and stressful time – even on such a fun night. 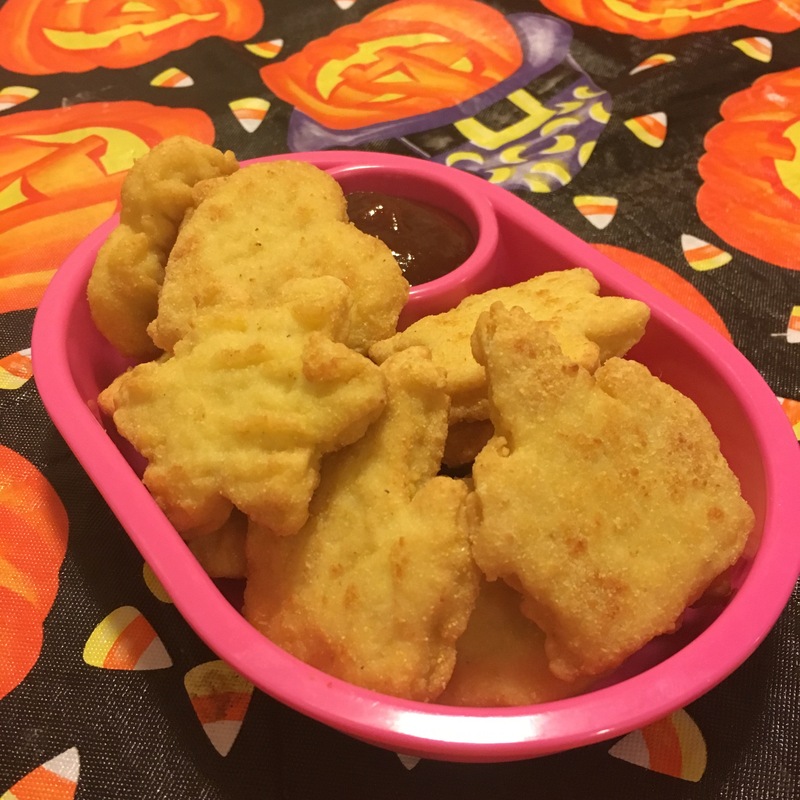 These delicious kid-friendly chicken nuggets are sure to get your kids in the trick-or-treating mood, and you won’t be spending all night in the kitchen. What are your kiddos dressing up as this year for Halloween? My Anthony is going to be Chase from the Paw Patrol. He is quite excited to get his candy and put it in his ‘pup-pack’. 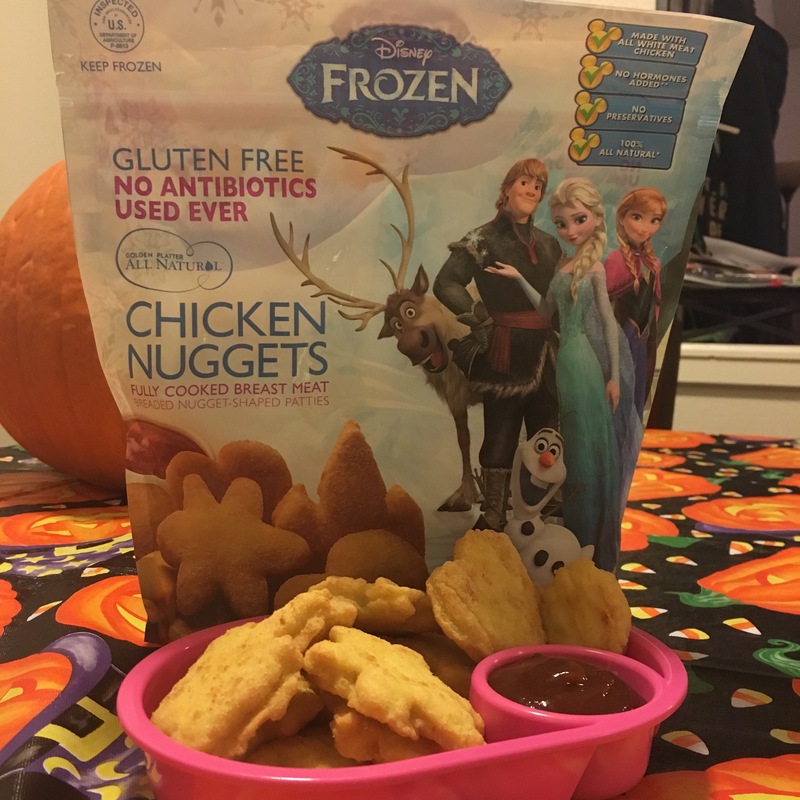 But for all of you parents with little ones dressed as Elsa, Anna or even Olaf, then these Golden Platter Gluten Free Disney’s Frozen Chicken Nuggets are for you! 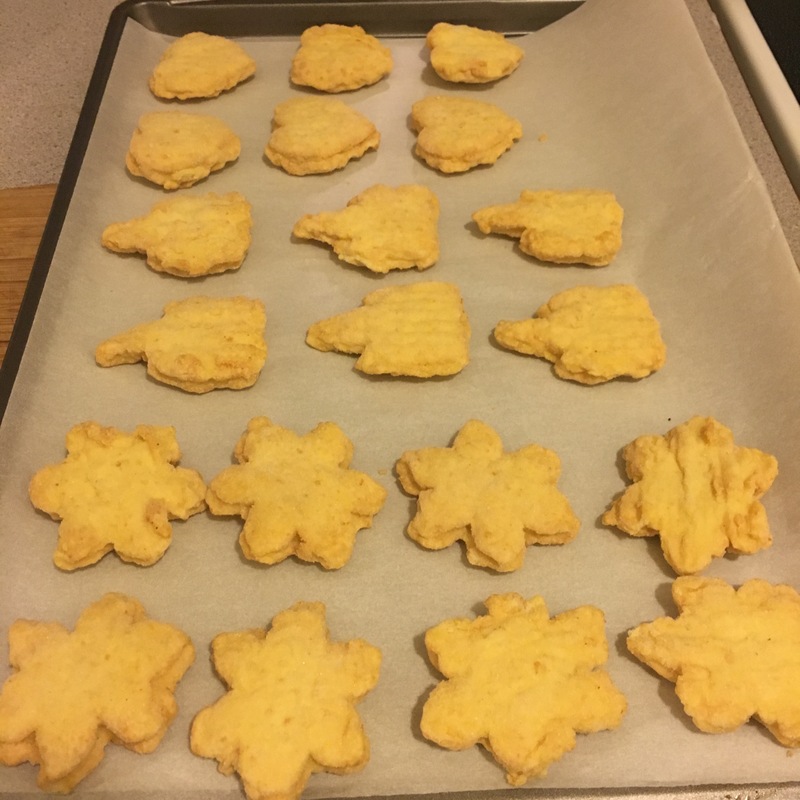 With Disney’s Frozen inspired shapes like Elsa’s castle, a heart and a snowflake, these chicken nuggets will get you singing, “do you want to make some chicken nuggets?” And if your kiddo is into StarWars, and is dressing up like a Han Solo, or Yoda, Golden Platter has you covered too with their Space Nuggets. There is also Zoo Shaped Nuggets for your little animal! 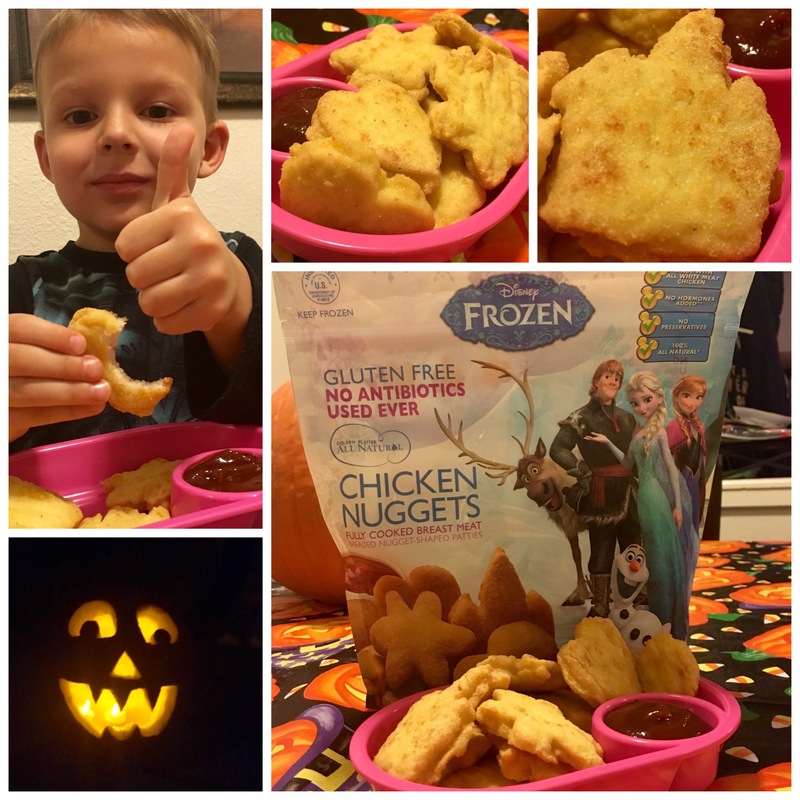 We tried the Disney’s Frozen Chicken Nuggets the night that we carved our pumpkin. I set the mood by playing some Halloween music on Pandora (which quickly changed as the Halloween Party station started playing Marlyn Manson), and placing a plastic Halloween themed table cloth on the table. 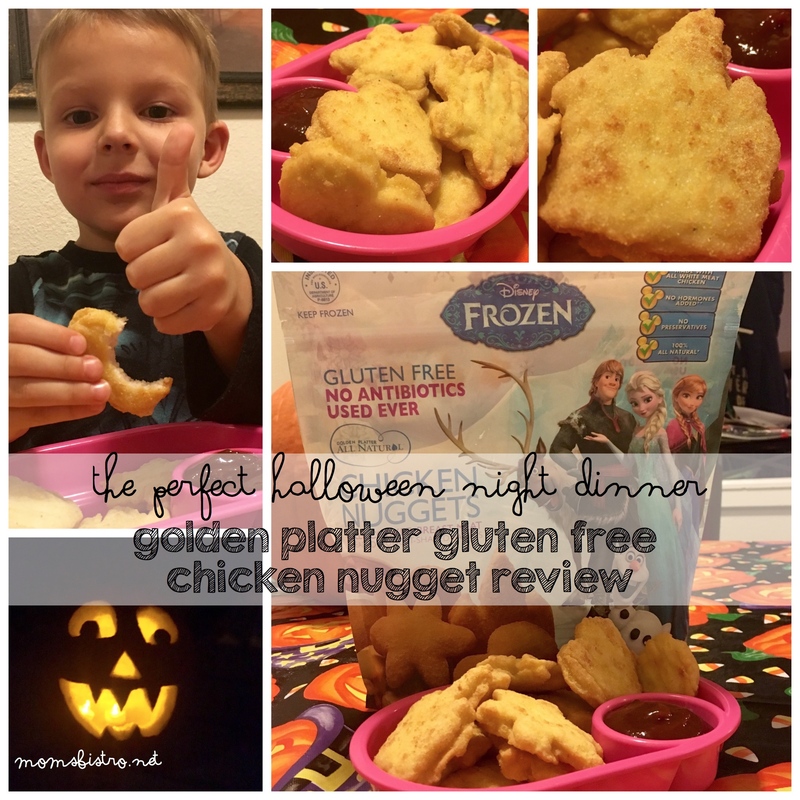 Golden Platter’s chicken nuggets were the perfect dinner since Anthony was bouncing off the walls waiting to carve his pumpkin. I gave Anthony the opportunity to pick between the Space Nuggets and the Disney’s Frozen Nuggets, and the Frozen Nuggets won by a long shot. 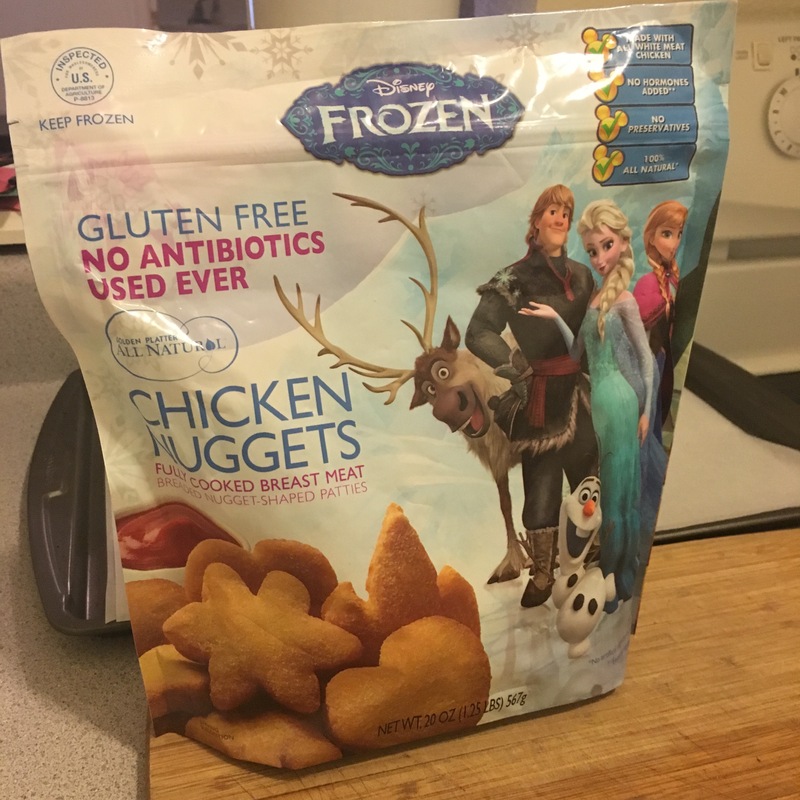 Boy or girl, kids absolutely LOVE anything Disney’s Frozen, which makes these nuggets a definite win especially for those picky eaters. So not only will your kiddos love the shapes and taste of Golden Platter’s Chicken Nuggets, parents you can rest assured that your kids are eating certified gluten-free chicken nuggets and that contain no artificial ingredients or excess sugars and are jam-packed with protein. 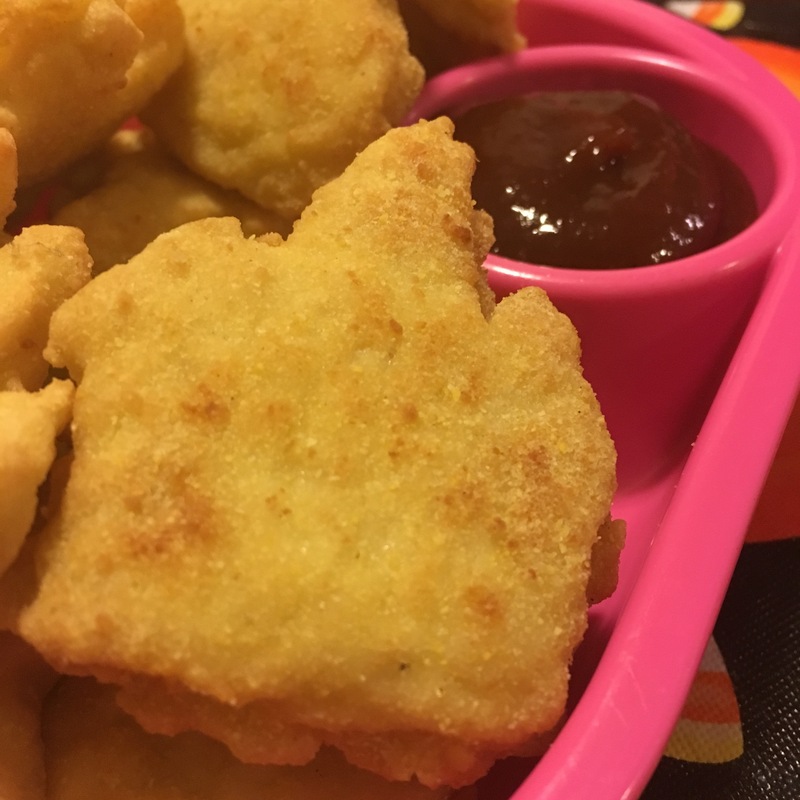 These nuggets are designed to make mealtime fun and provide a simple, clean alternative for children with gluten intolerance, these delicious morsels are perfect for picky eaters with and without food allergies. 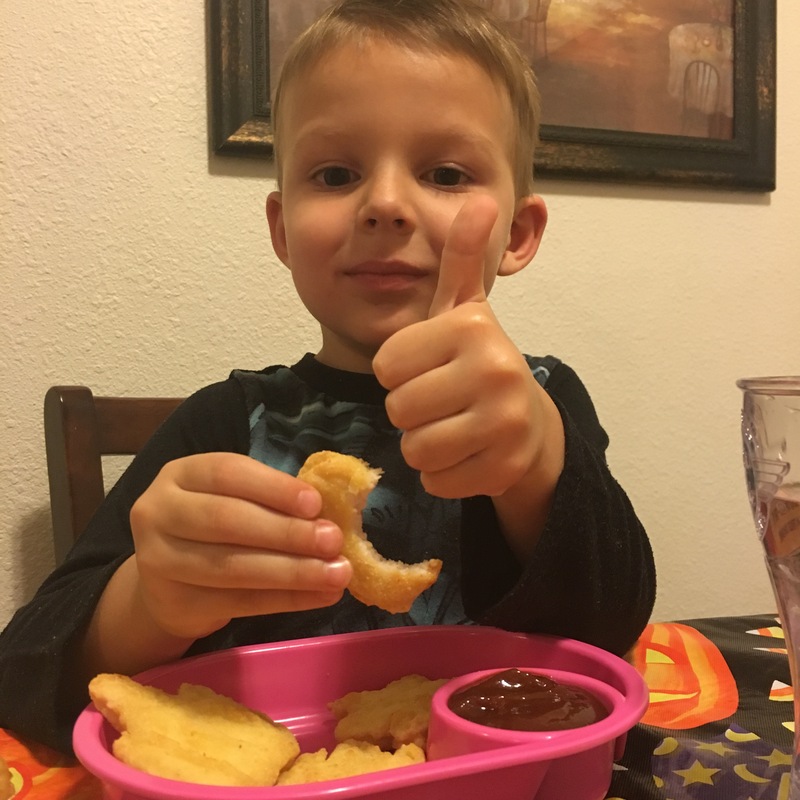 Even if your kids don’t have any gluten allergies, these chicken nuggets are equally priced to nuggets with gluten and are so much better for you and your kids as they contain 100% natural ingredients, and are produced without the use of hormones or preservatives, and are minimally processed. The chicken nuggets only took 11 minutes to cook after I preheated the oven. Most of the time when we get frozen chicken nuggets, they are all stuck together and are freezer burnt. The Golden Platter Chicken Nuggets we’re the exact opposite. 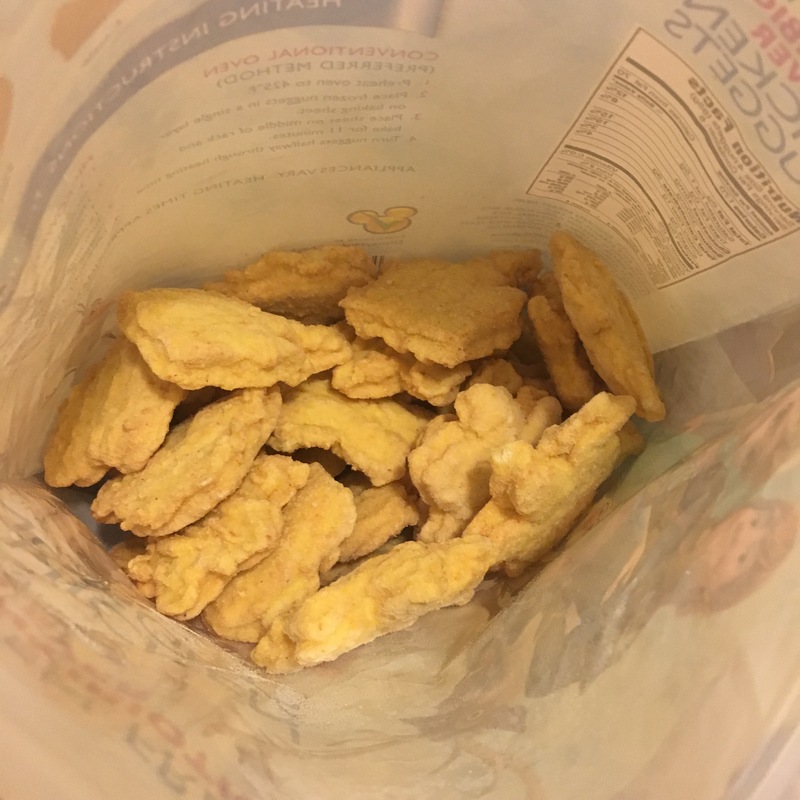 They all came out of the bag with no problem, and didn’t have gobs of breading all over them. The look and the taste of the nuggets actually reminded me of Burger King chicken nuggets, which is a great memory for me. We served our nuggets with some mini tater-tots and some mixed veggies. Anthony was very, very impressed. With each bite, we were getting a “yuuuummmm” from Anthony, and he gave them a big thumbs up. 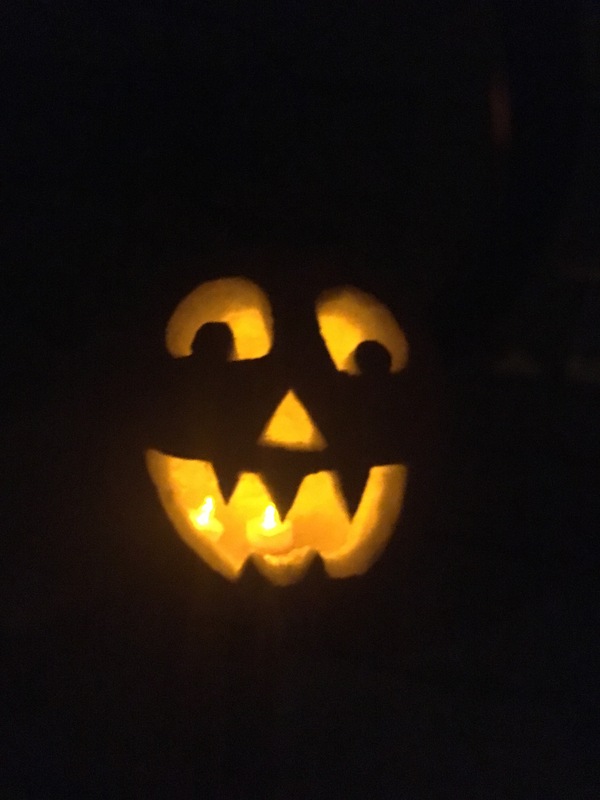 Our pumpkin carving was a huge success. 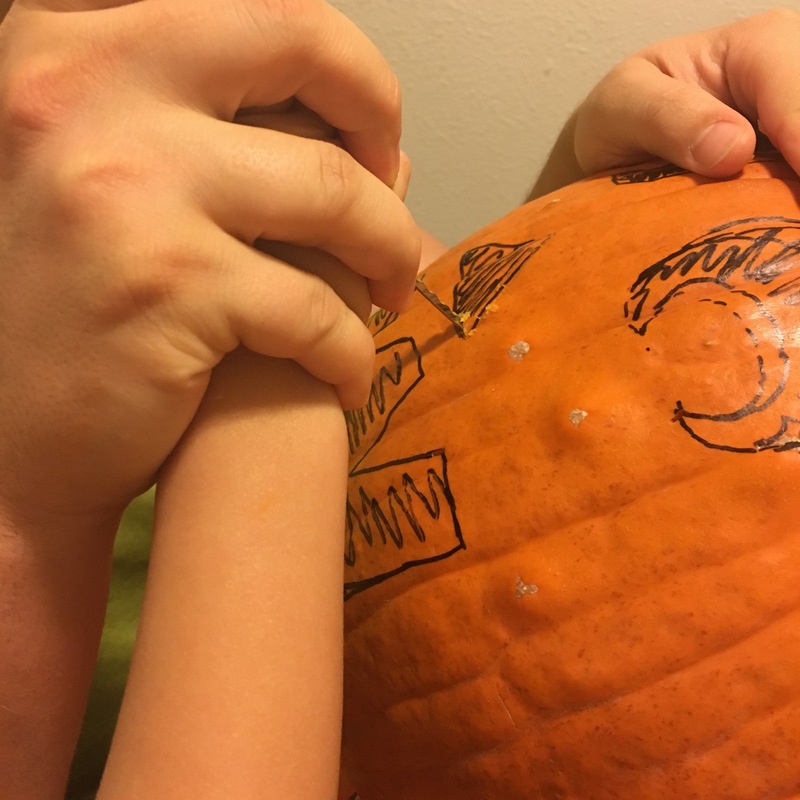 We worked as a family to get all of the guts out of the pumpkin – Anthony wasn’t too fond of this part. 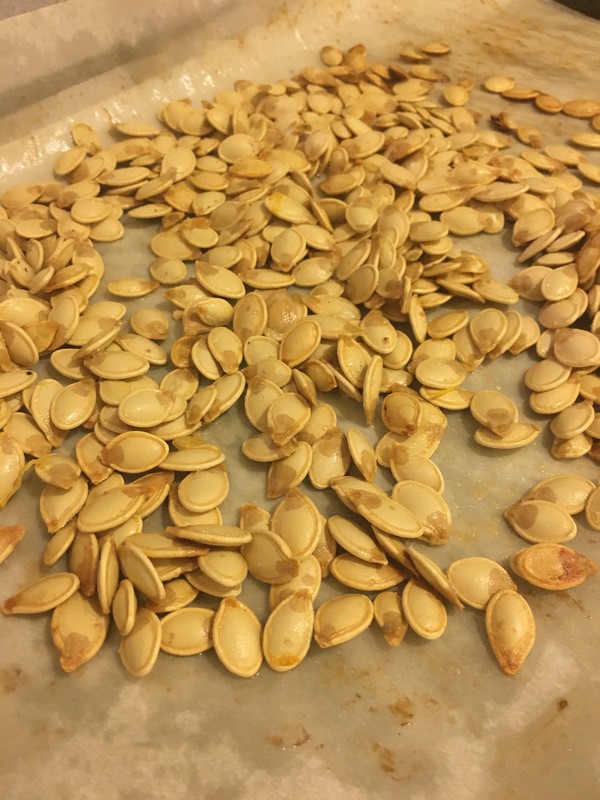 I drew the face on the pumpkin and Anthony and his Dad carved the face as I washed, seasoned and roasted the pumpkin seeds that we scooped out. 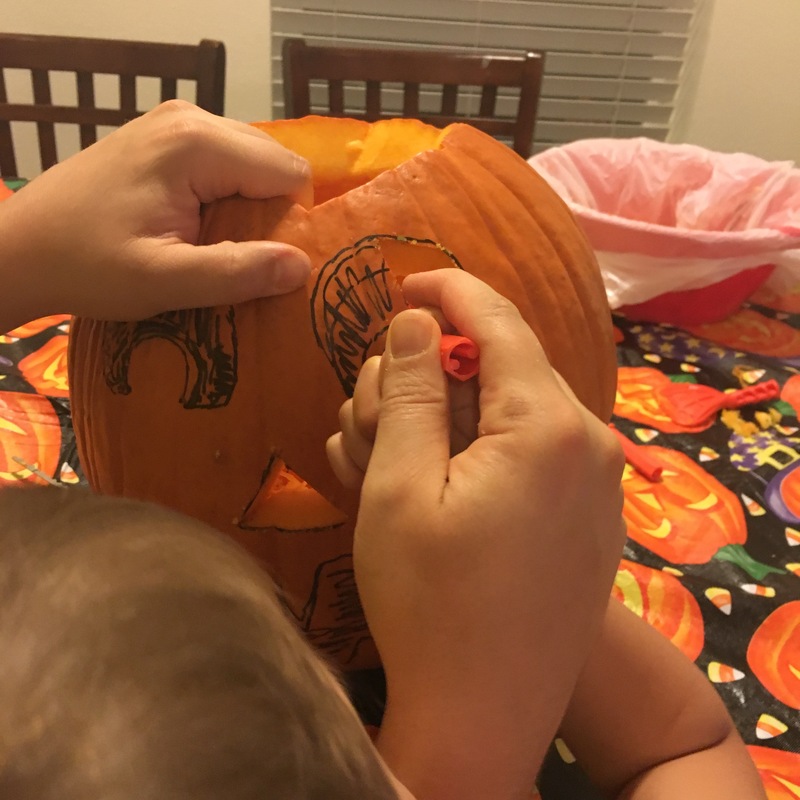 After carving the pumpkin we went outside and lit it up – I think this was the best part of the night, watching Anthony’s face as he saw his work. 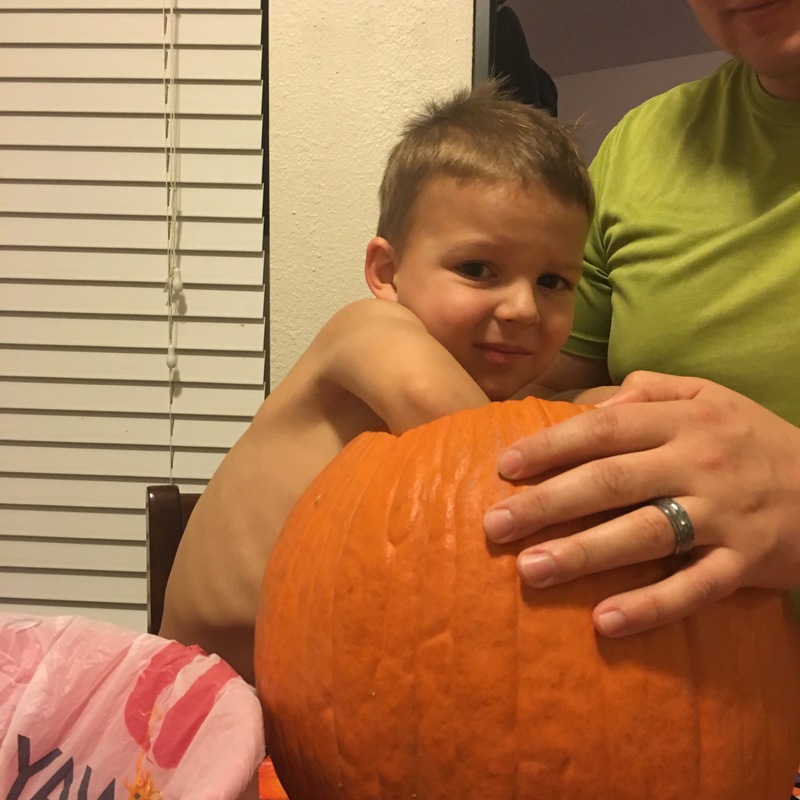 Between a kid-friendly chicken nugget dinner, family time carving pumpkins and seeing his hard work, this was one of those nights that he’ll remember for a long time. 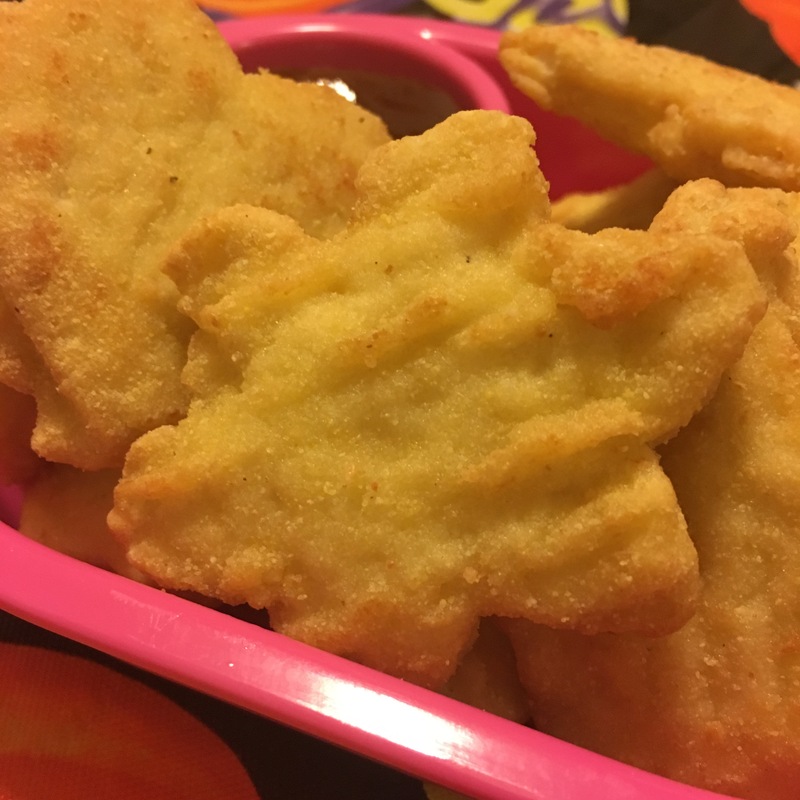 Since caving our pumpkin we have eaten all of our Disney Frozen chicken nuggets and have even broke into the Space Nuggets – which were also a big hit. 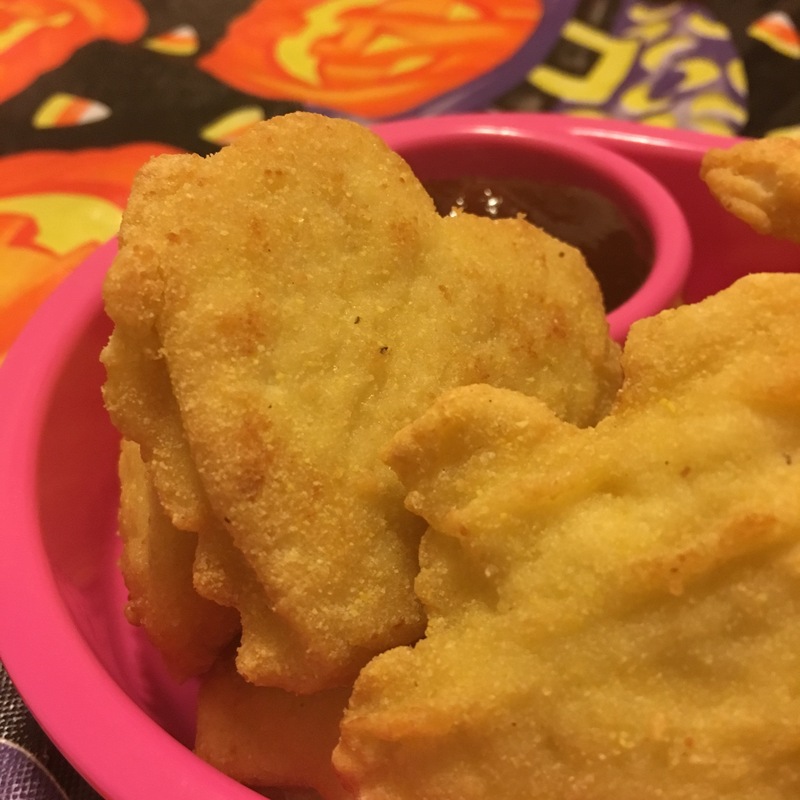 I loved how quickly these nuggets cooked up, and it makes them the ideal dinner for Halloween night. 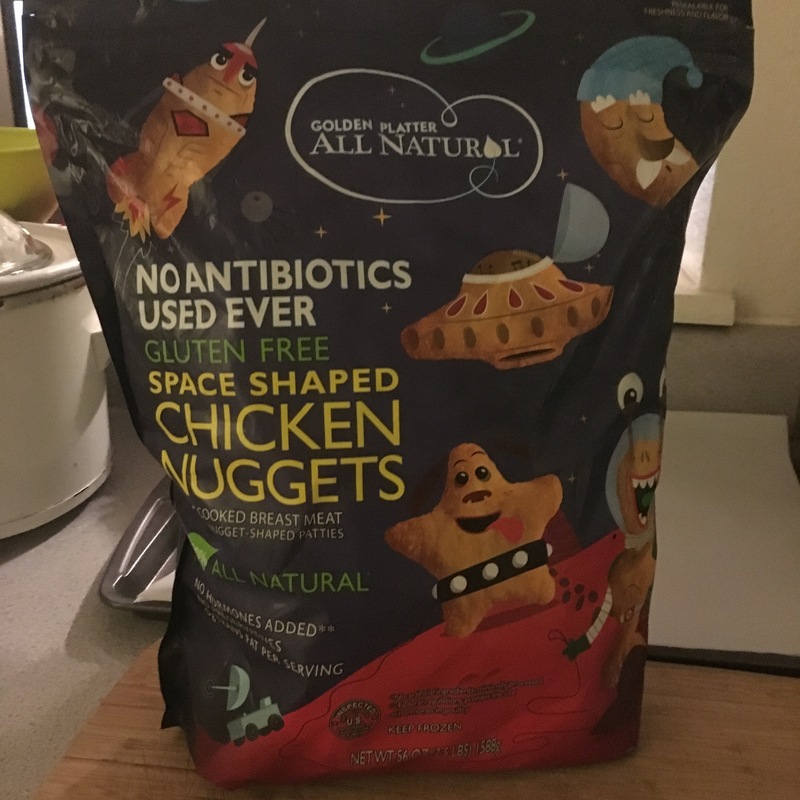 I am excited to serve up the Space Nuggets on Halloween night before we get dressed for trick-or-treating. Although I received these chicken nuggets for free, all opinions are my own and have not been influenced in any way. We really loved these chicken nuggets from Golden Platter. You can buy these chicken nuggets at Target, Walmart, Costco or Sam’s Club. They are similarly priced to other chicken nuggets out there, and are absolutely delicious. Anthony loved the fun shapes, and I loved how natural the ingredients were.